PT Kereta Commuter Indonesia - PT KCI (previously registered as PT KAI Commuter Jabodetabek) is reputable mass transportation services company in Indonesia. PT KCI is a commuter railways provider company that provides commuter railways transportation services in the area of Jakarta Metropolitan and its surrounding; Jakarta, Bogor, Depok, Tangerang and Bekasi, Banten and Cikarang. PT Kereta Commuter Indonesia is a directly-owned subsidiary company of state-owned railways operator PT Kereta Api Indonesia (Persero) or KAI Group. At present, PT Kereta Commuter Indonesia is 99.78% owned by PT Kereta Api Indonesia (Persero) and 0.22% by Pusaka Foundation. 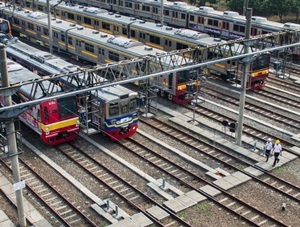 Headquartered in Jakarta, PT KCI runs its business through 826 units of Light Rail (KRL) which serving 72 stations throughout JABODETABEK with a range of service reaches 184.5 km (as of October 2016). According to PT Kereta Api Indonesia (Persero) Annual Report 2016 as cited by JobsCDC.com, PT KCI has recorded a significant growth and satisfactory performance in 2016. PT Kereta Commuter Indonesia booked total revenue of Rp2,044.95 billion in 2016. This number is up 18.2% from Rp 1,729.75 billion in 2015. Referring to its annual report, PT KCI booked a net profit of Rp288.39 billion, increasing 13.5% from net profit in 2015 of Rp254.12 billion. Male or Female, not older than 40 years of age. S1 Accounting, Taxation with study program accreditation "A" and minimum GPA of 2.95 on a 4.00 grade scale. Required managerial experience for minimum 3 years in the field of taxation. Solid knowledge of tax regulation, tax calculation, tax reporting and audit (PPh/PPN). Have ideal body weight / proportional. Willing to be placed in all working area of PT KCI. Male or Female, not older than 28 years of age. S1 Law with study program accreditation "A" and minimum GPA of 2.95 on a 4.00 grade scale. Minimum height of 160 cm with ideal body weight / proportional. Minimum SMA in any field with minimum average national exam score of 6.5. Minimum height of 160 cm and not color blind. Have an ideal body weight / proportional. Male, not older than 28 years of age. S1 Architecture Engineering with study program accreditation "A" and minimum GPA of 2.95 on a 4.00 grade scale. Minimum height of 160 cm and have ideal body weight / proportional. JobsCDC.com now available on android device. Download now on Google Play here. Please be aware of recruitment fraud. The entire stage of this selection process is free of charge. PT Kereta Commuter Indonesia - Staff, Assistant Manager KCI KAI Group February 2018 will never ask for fees or upfront payments for any purposes during the recruitment process such as transportation and accommodation.